-zip tie (may need more than one piece, depending on the size of it. 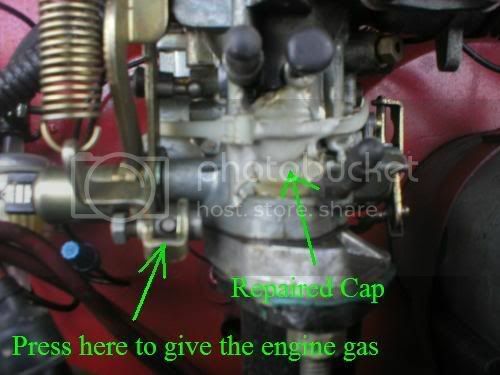 Note: If you aren't familiar with the carb and never even noticed there was a cap, like i was when it first happened, leave the car in neutral and open the engine compartment and give it a lil gas (pressing slightly on the piece on the left side of the carb where the accelerator cable connects) and you will see the gas inside the carb squirt. Then it will click: There should be something there! Self explanatory as it is from here, here is what you gotta do. Put the dime over the hole and hold it in place with your finger while you get it secured with the zip tie. THe zip tie should wrap around and be as snug as possible. If you only have a penny, you may need to file it. Same with the dime. WHen you get home reinforce the seal with JB weld. The first time it happened to me I just used high temp caulk. It held for about 6 months before the zip tie got worn and it came off again. Its been there with the JB weld for another 6 months or so and hasn't failed me yet. Here is a picture below, hope this helps some of you one day. thanks for the tip...what carb is that ? OH Great,now I'll have to go out into the shop to look at my carb. I vote 30pict, it's on a reducer. Dunno why,but allways like snow pics. Most of ours was melted off by that bloody windstorm last weekend. Along with a bunch of trees and a few roofs.